How long has it been since you watched the pilot episode of The Fosters? The show’s season 4 premiere is steadily drawing closer (in case you missed it, Freeform recently released a gripping preview) but there are still a few weeks left to go, so we decided to put together a flashback recap of The Fosters 1×01 to make the wait a little easier. What’s a flashback recap? In a nutshell, it’s an episodic recap with the benefit of hindsight – 62 episodes and three seasons’ worth of hindsight, to be specific. If you can believe it, the show first aired on Freeform (then ABC Family) three years ago, when The Fosters 1×01 introduced us to the colorful cast of characters we still love – and sometimes love to hate – today. Read on for part one of our flashback recap. The opening scene of The Fosters 1×01 takes place at the Chula Vista Juvenile Detention Facility, and the first face we see is Daphne’s. Later in the season, we learn that Daphne’s a teen mom whose involvement in drugs and gangs caused her to end up in juvie, but right now, we only know one thing: She has it out for the waif-like brunette who’s behind her in line. The aforementioned waif-like brunette, a.k.a. Callie, is getting out of juvie that day, so Daphne’s seizing the moment to get back at Callie for causing her to lose her yard privileges. It’s safe to say that Daphne and Callie’s relationship does a major 180 by the end of season 3, to the point where Daphne’s willing to help Callie discredit “foster advocate” Justina’s reputation… even though that means risking the steady pay check she needs to earn back custody of her daughter. In The Fosters 1×01, however, the only thing Daphne’s interested in giving Callie is a beatdown. Elsewhere, Brandon is performing onstage at the prestigious San Diego Music Society Annual Competition – and for some confounding reason, he’s wearing sneakers. (You may wish to interpret this fashion faux pas as the first of many bad life choices Brandon makes on the show.) 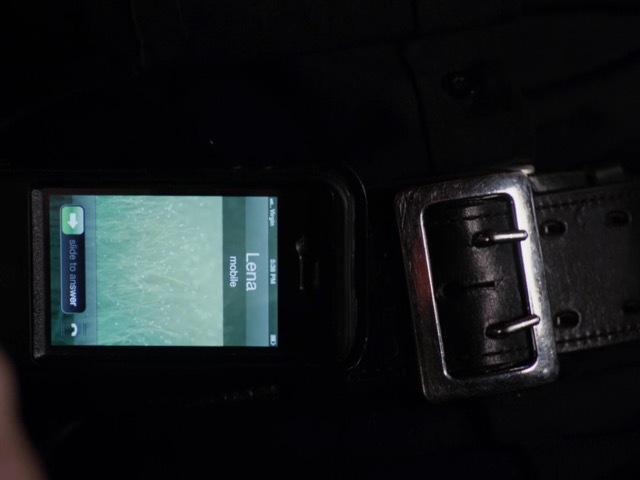 In the audience, proud mama Stef is all decked out in her SDPD uniform, blissfully unaware that the phone clipped to her belt is vibrating with a call from Lena. Side note: Remember the old iPhone interface? Doesn’t it look really clunky and outdated now? Also, no way would Stef’s lock screen be anything other than a family photo. Cut to the aforementioned Lena sitting in her car as the call goes to voicemail. Stef’s trademark bluntness is evident right from the get-go, as her recorded message begins, “Hey, it’s Stef; I’m either working or avoiding your call.” Unable to connect with Stef or Bill (the social worker Lena typically deals with), Lena speaks with Bill’s colleague, David, who tells her about a girl named Callie in need of a temporary foster home. Lena: …Why [Bill] thought of us. I think it’s fair to say that the pre-premiere buzz meant many viewers tuning in to The Fosters 1×01 knew ahead of time that the show would feature a lesbian couple, but I still love the subtle way Lena and Stef’s relationship was first alluded to. Here’s something Lena doesn’t love: finding out that Callie landed in juvie for property damage and fighting with her foster father. “[Bill] has been a friend of the family ever since he placed the twins with us, but I cannot bring someone violent into my house,” Lena tells David firmly. As any Fosters fan knows, Lena is fiercely protective of her kids, and it’s interesting to see her initially react to Callie not as someone to protect, but rather to protect against. David tries to get Lena on board with the idea of providing a short-term foster home for Callie, claiming it’s a “one-time thing” that’ll only be “for a few weeks.” Hey, remember that time Stef and Lena formally adopted Callie in The Fosters 3×10? Yeah, so much for a few weeks. 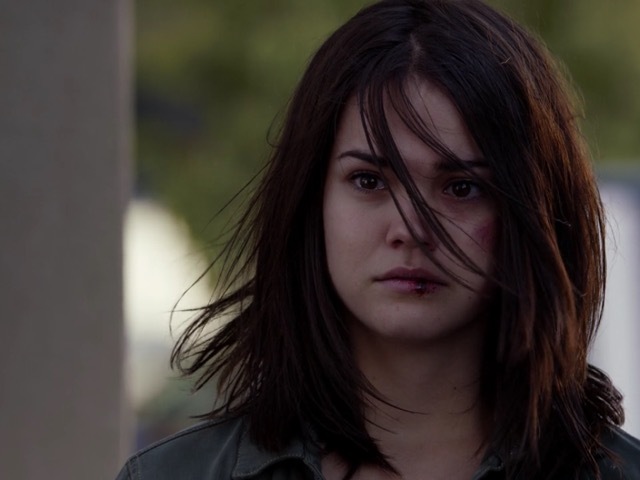 At this point in The Fosters 1×01, though, adoption seems like the furthest thing from Lena’s mind – especially after she sees the bloody lip that Daphne gave Callie. Over the course of three seasons, Callie’s life has changed in myriad ways, but her little brother has always been a constant. With this in mind, it’s fitting that the first words out of Callie’s mouth are “Where’s Jude?” David, who’s pinch-hitting for his colleague Bill and consequently has very little knowledge of Callie’s case, can’t give her an answer. As David ponders taking Callie to a group home, Lena’s big heart wins out. “It’s just for a few weeks, right?” she rationalizes. Riiiiiight. Back at the Foster house, Lena tells a sullen Callie that the twins also used to be in the foster system while Mariana tosses salad and Jesus sets the kitchen table. (When else has that table ever featured place mats and cloth napkins? Callie’s presence must be kind of a big deal.) When Callie excuses herself to go have a meltdown in the bathroom, Lena comes clean to the twins about the real reason she’d been trying to connect with Bill, and they’re nonplussed by the news that she wants to set up a meeting with their birth mother. Although Lena expected a lackluster reaction from Jesus, Mariana’s attitude takes her by surprise. Of course, we find out later that Mariana is already secretly communicating with – and being manipulated by – Ana, but it’ll be a long time (and a lot of episodes) before Ana gets clean, provides some of the answers that the twins are looking for, and, oh, yeah, strikes up a romantic relationship with Stef’s ex-husband, Mike. Just then, a wild Brandon appears – and he bringeth tidings of joy. His performance at the music competition won him a place in the finals, not to mention a shot at a $5,000 scholarship. For me, rewatching The Fosters 1×01 really underscored how far Brandon’s come with his music. Think about it: He joined Someone’s Little Sister, got into Idyllwild, wrote and performed in a rock opera version of Romeo & Juliet, and scored an audition to get into New York’s prestigious Juilliard School, all after getting hand surgery and facing the threat of never being able to play the piano again. When Callie returns from the bathroom, her initial meeting with Brandon is… well, underwhelming, considering the Brallie roller coaster that lies ahead. “Who’s this?” Brandon asks, and while it’s a valid question, his delivery needs work. When Lena explains, he offers Callie an awkward “Nice to… meet you…” plus a dollop of lasagna for good measure. Of course, Callie isn’t exactly being a paragon of politeness herself when she rudely asks Lena, “How’d you get him?” and the ever-patient Lena tells her that Brandon is “my partner Stefanie’s biological son from her previous marriage.” Before Callie can wrap her head around that, Stef appears and greets Lena with a kiss while Callie stares incredulously. The Fosters season 4 premieres on Freeform at 8/7c on Monday, June 20. Watch the preview here.